*Maintenance plans are for websites that I have designed. At this time I am unable to take on clients who currently have a website and need updates and maintenance. If you are interested in a redesign please contact me. Don’t want to pay all at once? Subscribe to a monthly maintenance plan! Small changes to the website. 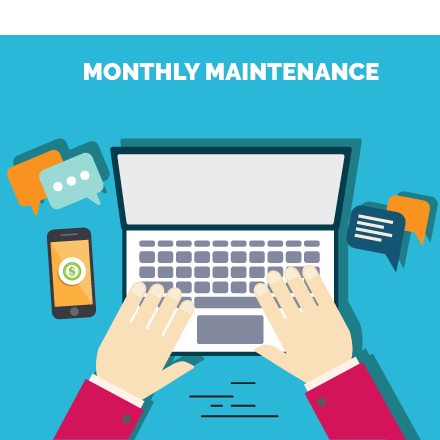 So why do I need a maintenance plan for my WordPress site? Your WordPress website needs regular maintenance to perform as it should. Updates are always being made to WordPress itself as well as themes and plugins. Keeping your WordPress installation up-to-date is extremely important, especially since so many WordPress updates are security fixes and patches that will prevent potential exploits of the vulnerabilities of your website or blog. Focus on what YOU like to do. Let the LunaBlu Design handle the website. I’m happy to answer any questions about the maintenance plans. We can also develop a customized plan if what you see here doesn’t suit your needs.